Zrobim! environmental campaign opens its sixth season. Bike Carnival will be held in Minsk on May 12. Death penalty discussion resumes. 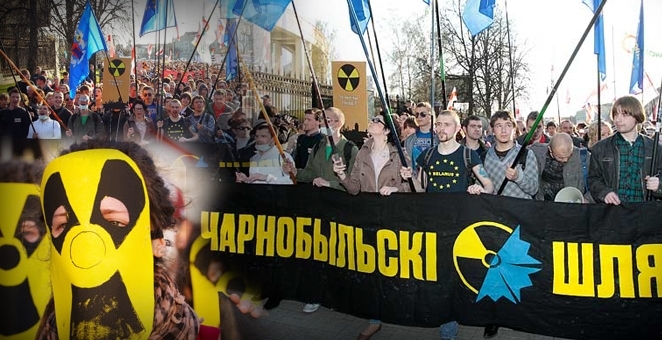 Organizers of the annual Chernobyl Path rally start a local fundraising campaign. Amendments to media law pass first reading in the parliament: BAJ suggestions not considered so far. 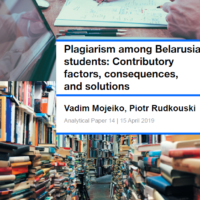 BAJ monitoring report: in 2017, the situation was one of the toughest for Belarusian independent journalism in recent years. Belarusian Helsinki Committee presents a guide on human rights-based approach. Brest citizens protest against dirty plant construction, protesters detained on May Day in Minsk. Drug convicts’ relatives still on hunger strike, seeking a meeting with Lukashenka. Belarusian Army ranked 41st out of 136 nations. Zrobim! environmental campaign opens its 6th season. Zrobim! is a part of Let’s Do It! global movement and organized by Belarusian environmental CSOs since 2012. Starting from April 21, volunteers clean unauthorized dumps and put them on an online map. The campaign will end on the Global Cleaning Day in September when the volunteers from 150 countries will come to the action all over the world. Viva Rovar! Bike Carnival to be held in Minsk on May 12. This year the bicycle carnival Viva Rovar! (Viva, Bike!) is organized for the 3rd time. Last year, over 11,000 participants from Belarus, as well as Ukraine, Russia, Sweden, Lithuania and other countries registered for participation in the bicycle parade. The Minsk Cycling Society is among the organizers. Round table on the abolition of the death penalty in Belarus held on April 18, Minsk. Organized by the Council of Europe the event involved members of the Belarusian Parliament and representatives of CSOs. Belarus is still the only executioner in Europe and Central Asia. Amnesty International in its annual report records at least two death sentences in Belarus in 2017 compared to at least four in 2016. Charnobylski Shlykh action collects money through crowdfunding. Charnobylski Shlykh/ Chernobyl Path is a traditional action organized by political parties and CSOs on April 26 to remind about the consequences of the Chernobyl disaster in 1986. The organizers plan to raise 5K rubles ($2,500) to cover an information campaign. The recent political action on Freedom Day of March 25 collected almost $27K through crowdfunding. Two thousand Brest citizens protesting dirty plant construction. On April 29, a Brest park was filled with protesters who gathered for a rally against the construction of the plant, approved by the authorities. A Chinese company is building a battery plant at a rapid pace near Brest. The work of the plant can cause severe damage to human health due to lead emissions. Protesters detained on May Day in Minsk. At least nine people were arrested by the police before and during the protest in Minsk, which was organized by the REP Trade Union. The gathering was authorized by the city administration. Five of them are associates of the opposition leader Mikalai Statkevich. Later anarchist Vyachaslau Kasinerau was sentenced to 10 days of administrative arrest. Drug convicts’ relatives still on hunger strike, seeking a meeting with Lukashenka. On April 27, the members of the Mothers-328 movement started an indefinite hunger strike, seeking to mitigate the punishment under criminal article 328. They believe that punishment for drug users is disproportionate and too severe. Leadership in Local Communities kicked off. The long-term educational program has been launched for the 3rd time to empower grassroots leaders to lead positive changes in local communities. 28 activists from 25 communities were selected for this round. The program is implemented by the Office for European Expertise and Communications in partnership with Pact and the support of USAID. Free educational course on Internet marketing for small towns launched. The project Job Connected allows people who lost their jobs or not satisfied with the conditions of their work, to acquire competencies to earn remotely. The educational online course runs from April to July. 440 people registered for participation, including residents of over 40 small Belarusian towns. Amendments to media law pass first reading: BAJ suggestions not considered so far. The Parliament approved the changes to the Law on Mass Media in the first reading with 98 MPs voted pro, 2 voted contra and 2 people abstained. One of the innovations is the mandatory identification of users posting comments on websites. A special commission will consider the suggestions of the Belarusian Association of Journalists (BAJ) before the second reading. BAJ Monitoring Report 2017. The Belarusian Association of Journalists (BAJ) released an annual report on the situation in the sphere of Belarusian mass media last year. The key finding is that the situation appeared to be one of the toughest for Belarusian independent journalism in recent years. Thus, 101 cases of detention of journalists on duty were registered in 2017 compared to 13 cases in 2016. Belarusian Helsinki Committee presents a guide on human rights-based approach. The guide in a user-friendly manner gives deeper and specialized knowledge how to add human rights to daily life, civic projects, and business. The service is provided in collaboration with The Danish Institute for Human Rights. European Parliament adopted a resolution on Belarus on April 19. The resolution supports the EU’s critical engagement with Belarus, as long as it is conditioned on the Belarusian authorities’ complete respect for fundamental freedoms and human rights. The document urges continued EU support to civil society organizations and human rights defenders. IMF improves Belarus’ GDP growth forecast. Belarus’s economy will expand by 2.8% in 2018 and by 2.4 in 2019, the International Monetary Fund (IMF) said in the April edition of its World Economic Outlook report. Earlier, the fund forecasted Belarus’ GDP growth at 0.7% in 2018. 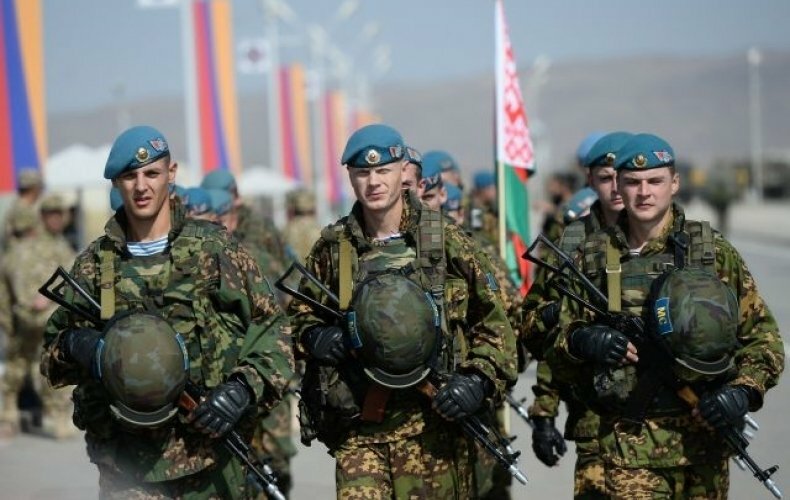 Belarusian Army ranked 41st out of 136 nations. Last year Belarus took the 49th place in Global Firepower list. Military resources, diversity of weapon systems, natural resources, industry and geographical features, available manpower are taken into account. In 2017, the country increased arms exports by 15% and earned over $1 billion. Lukashenka rejected plans for a constitutional referendum. The Operational and Analytical Centre head gives their first ever interview. Lukashenka rode a tractor to plant corn with Moldova’s president Igor Dodon. Counterfeit alcohol from Russia floods the Belarusian black market. Belarusian exports remains concentrated in very few markets and need diversification. The visa-free regime in Hrodna attracts Poles and Lithuanians. All this in the latest edition of the Belarus state press digest. Lukashenka rejected plans for a constitutional referendum. On 24 April, Alexander Lukashenka delivered his annual state of the nation address to the Belarusian people and the parliament, reports Belarus Segodnia. During the one-and-a-half-hour speech, he discussed a variety of issues, including the rumours about planned changes to the constitution. “If someone thinks that we will change the constitution, and thus create the conditions for a Maidan here, [then they should know that] this will not happen.” The president claimed that the Belarusian opposition does not want to take power because it does not know what to do with it. However, he also said that he can safely transfer certain presidential powers to other governmental bodies because the system functions well. Lukashenka admitted that Belarus currently fails to use its geographical potential in terms of logistics: people prefer to fly from Kiev, Vilnius, or anywhere other than Belarus. He also confirmed government intentions to establish a special ministry for information technologies soon. “By 2020 Belarus should appear to the world as attractive, comfortable and progressive,” the Belarusian president demanded. Lukashenka and Moldovan president Igor Dodon rode tractors and planted corn. On 18-19 April, Lukashenka visited Moldova, reports Zviazda. 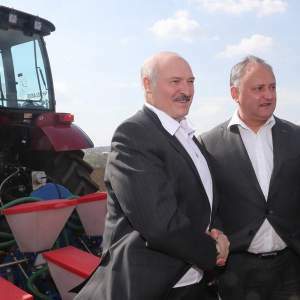 The presidents of Belarus and Moldova attended an exhibition of modern Belarusian agricultural machinery at the Institute of Plant Industry, discussed developing cooperation in this field and then planted a corn field, with the presidents driving their own tractors. Igor Dodon said that most of the wines produced in Moldova go to Belarus. Given the high popularity of Moldovan wine, Dodon promised to teach Lukashenka how to grow grapes. During the visit, the Government of Belarus and the Moldova-Agroindbank (a commerical bank) signed an agreement on the lending terms for the purchase of Belarusian goods. Moldova’s prime minister, Pavel Filip, remarked that jointly-produced Moldovan-Belarusian trolleybuses will be exported to the EU without customs duties and therefore suggest a promising area for further cooperation. The head of the Operational and Analytical Centre (OAC) gave his first interview ever. On the special service’s 10th anniversary, its head Andrej Paŭliučenka furnished Belarus Segodnia with details of work at the centre, created to ensure the protection of information and the development of internet technologies. Paŭliučenka characterised early attacks on Belarusian information systems as disorganised and spontaneous. In recent years, however, hacker teams seem to have one or more coordination centres. These groups try to hack into Belarusian defence systems with geopolitical or mercantile goals. Turning to internal threats, corruption remains the most serious issue and the OAC particularly deals with combating corruption at the highest levels of power. Paŭliučenka also said that the OAC does not shut down websites as many think. It provides for the stable and reliable operation of networks and databases; the OAC serves as engineer and architect of the national segment of the Internet. Counterfeit alcohol from Russia dominates the Belarusian black market. Narodnaja Hazieta investigated the black market for alcohol in Belarus. Black marker dealers sell half a litre of vodka for 1 euro online, while in the stores the same volume costs 3 euros. Five-litre cans of so-called “confectionery brandy” are offered for 12 euros. According to the Central Department for Combating Economic Crime, more than 95% of illegal alcohol products entering Belarus come from Russia. Indeed, large criminal groups run a highly profitable business. The influx of counterfeit alcohol has even made the traditional moonshine industry less attractive among the population. While in 2011 the police confiscated 111,400 decalitres of moonshine, in 2015 it took away only 69,200 decalitres. Counterfeit alcohol is typically of poor quality and often causes poisoning. According to information provided by the Minsk Regional Department of Internal Affairs, during the first 3 months of 2018 in the Minsk region alone, 61 people died from the consumption of ethyl alcohol or other alcoholic surrogates. Belarusian exports remain concentrated on a few markets and needs diversification. In 2017 and early 2018, Belarusian exports saw stable growth for the first time since 2012, according to Zviazda. A favourable situation in the raw materials market and in the markets of Belarus’s major trading partners contributed to this growth. However, geographical diversification for export goods remains lower than the government expects. In January – February 2018, five national markets accounted for almost 71% of Belarusian exports. However, the share exports to Russia saw a positive trend. In January – February it amounted to 38.2% compared to 45% over the same period last year. Speaking about commodity diversification and the example of exports to the European Union, Prime Minister Andrej Kabiakoŭ noted that Belarusian exports to the EU consist of a narrow range of goods with a significant share of petroleum products (50%). “The high concentration on the market of one or a few countries, or in a narrow range of goods, poses significant risks for our country,” the Kabiakoŭ said. The visa-free regime in Hrodna attracts Poles and Lithuanians. Before the introduction of the visa-free regime in Hrodna city, it received 4,700 tourists per year. Since the introduction of the new visa regime, 52,000 foreigners visited the nearby Augustow Canal alone. According to Respublika, 35-40% of tourists travel only for shopping. Visitors mostly buy goods that cannot be found in their home country: medicine, marshmallows, jellies, kvass, birch sap, linen, jersey and alcohol. Lithuanians show strong interest in the historical sites connected with the Grand Duchy of Lithuania, the medieval state of Belarusians and Lithuanians. The head of a Polish tourist company from the city of Bialystok, Eugeniusz Laureniuk, notes that religious tourism in Belarus has become popular with Poles in recent years. Active tourism, especially cycling tours, also remain popular. But the lack of hotels, especially in small towns, presents a serious problem. While Hrodna and Brest more or less cope with accommodating tourists, Lida and Baranavičy, both towns with 100,000 inhabitants have only one hotel each.